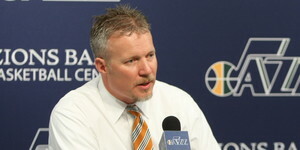 Greg Miller (born c. 1966) is Chief Executive Officer of the Utah Jazz and the Larry H. Miller Group of Companies, started in 1979 by his father, the late Larry H. Miller. During his first year as CEO (2008), he cut $29 million in expenses to help the company stay viable. In 2014, Forbes valued the Jazz at approximately $535 million. His first job with his father’s company was to sweep rocks off the parking lot of the first dealership in Murray, Utah. He left the company for a time to start his own company, and later returned to work for his father. He gradually took on more responsibility and was tasked with running Miller Motorsports Park when it opened in 2006. Miller likes to travel and collect Land Cruisers. He drove the same vehicle on all seven continents, which took three years and covered 58,196 miles—a journey he made with his wife and family, friends, and many others.. A total of five Land Cruisers were used and are on permanent display at the Toyota Land Cruiser Museum in Tooele, Utah. Miller is a member of The Church of Jesus Christ of Latter-day Saints. This page was last edited on 3 March 2015, at 16:31.